While an assortment of wildflowers strews vibrant spring color across the Texas landscape, pastel lavenders and pinks do their own part to decorate the season. 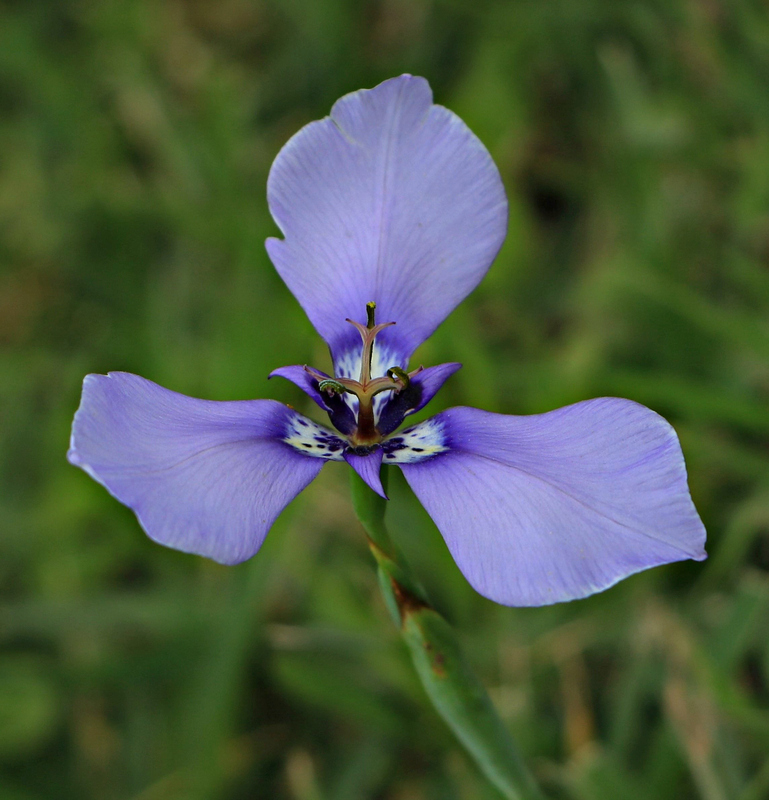 One of my favorites, Herbertia lahue, or prairie nymph, is a small and delicate member of the iris family. The flowers appear for only two or three weeks, and each flower lasts for only one day; finding an entire colony at the Varner-Hogg plantation outside West Columbia was as lucky as it was delightful. Originally owned by Martin Varner, a member of Stephen F. Austin‘s Old Three Hundred and a veteran of the Texas Revolution, the property’s last owner was James Stephen Hogg, the first native Texan to be elected governor. Donated to the state in 1958 by Governor Hogg’s daughter Ima, the historic site provides a view of plantation life in Texas between 1835 and 1850, the time of the plantation’s greatest productivity. Contrary to jokes told even during her lifetime, Ima Hogg didn’t have a sister named Ura, but she was a remarkable woman and a great philanthropist. After helping to found the Houston Symphony Orchestra in 1913, she became president of its board in 1917. Elected to the Houston Board of Education in 1943, she arranged symphony concerts in public schools and worked to increase the number of music and art classes available to students. Eventually she donated Bayou Bend, her home in the River Oaks neighborhood of Houston, to the Houston Museum of Fine Arts. The antiques-filled house and formal gardens are balanced by woodlands filled with native trees and shrubs: a testament to her conviction that the same plants that grew wild on the plantation at the edge of Varner Creek should have a place to thrive in the heart of Houston. I doubt there are prairie nymphs at Bayou Bend, but out at the old plantation they’re doing just fine. Oh wow, what a story, and what a sight! Dare I say, Miss Ima isn’t pushing up daisies but beautiful iris. Still making music. The Hogg family plot actually is in Austin’s Oakwood cemetery, but that’s not to say her spirit doesn’t visit the old plantation from time to time. The story of the plantation is fascinating. There was another owner between Varner and Hogg, named Patton. John Patton purchased the place in the name of his son, Columbus, and it became a prosperous sugar mill for some years. Eventually, circumstances (including Columbus being shipped off to an insane asylum) ended the Pattons’ involvement. The Patton gravesites still are there, as well as remnants of the old sugar mill and Governor Hogg’s personal outdoor bathtub. The history deserves a much longer post, which I’ll probably provide one of these days. Thanks, GP. I’ve seen the little flower even in traffic medians around here. It’s very adaptable, as well as being pretty. This is a species I think I’ve seen only once, between Austin and Bastrop. I’ve wondered what the lahue means. When I checked in Shinners and Mahler’s just now I learned that its origin is unknown. Perhaps your readers would like to know what Ima Hogg looked like. After years of hearing the jokes about Ima Hogg’s name — even before coming to Texas — I was surprised to find her quite an attractive woman. The photo of her as a child in front of the house is wonderful. I suspect I’ll find a use for that in the future. This is a wonderful story of family and the beauty of it all is breathtaking — what a field of flowers! I love the delicate blossoms — they’re so pretty! I can see that Miss Ima would indeed be pleased! Interestingly, this is very nearly the same spot where I found the squirrel in the tree limb and the four-foot rat snake. There’s so much there that’s both beautiful and interesting. The site’s well maintained, and the house is especially appealing. The last time I was there, so many people were visiting I didn’t even try for photos, but one of these days I will. The kitchen, in a separate building, was one I wouldn’t mind working in. Another entry in our bucket list. ;) Thanks, Linda! There’s just something about a field of flowers that appeals. The most interesting thing to me is how a given flower will appear en masse one year, and then disappear the next. Some can be depended on to at least show up, but the where or when of their arrival isn’t always so predictable. That’s part of the fun. It’s really interesting, and for me pure guesswork, how/when they appear. But all the more fun when it happens. I remember writing about Ima in my blog on one of my trips through Texas. As I recall it was when I visited Austin. No doubt, she was a great woman, aided considerably by the oil discovered on her property. Our irises are about to burst into bloom. And your photo reminded me of the variety I found along the PCT last year. 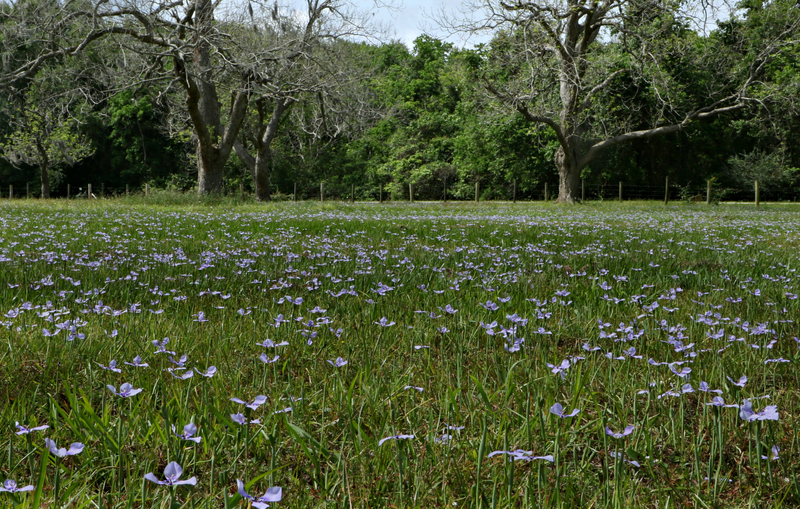 Several of my favorite native flowers are in the iris family, including blue-eyed grass and prairie celestials. They all have wonderful names to go along with their beauty. I can see the family resemblance to other members of the iris family, including my favorite, the bearded iris. Lovely color. Nice and rich. I like the doings in the center. Almost reminds me of fleurs de lis. Speaking of “doings in the center,” how about this little gem? I didn’t like the photo well enough to publish it, but it certainly shows how deep and vibrant the color can be, and how attractive the flower is to more than the human eye. I’d not thought of fleurs de lis, but I can see it. The three petals certainly do suggest it. What a beautiful flower! I had not heard of it before, and of course, haven’t seen one. I do love iris though. The iris family has so many lovely flowers, many of which don’t look particularly like irises — especially at first glance. This one’s so small and delicate. I’ve seen some with stems as long as six inches, but four seems more common. If the surrounding grasses have any height at all, they can be hard to see. One of our favourite flowers, the iris. We put some in last year and are now waiting till spring-time. They are beautiful flowers. Our natives aren’t as fancy as the cultivated varieties, of course, but they’re just as lovely, and coming upon a stand of them in a ditch can be a wonderful surprise. They’re certainly worth waiting for. I suspect our wild ones might be gone now — perhaps I’ll make a little drive this afternoon to see how my favorite patches are doing. We’re accustomed to seeing Indian paintbrush, primroses, and bluebonnets cascading across fields, but finding these in any number seems to be more uncommon. This is the only such field of them I’ve seen, anyway, and it thrilled me no end. You’ve reminded me that there’s another native flower in the iris family called the prairie celestial. It’s as small, delicate, and ephemeral as these — and the loveliest shade of blue. Such a lovely Iris. Perhaps it should be renamed Herbertia lahue v.hoggii. I have to admit I would have seen the humor in her name when I was a kid. I once had a neighbor named Stephen Bator and you might guess how he was addressed as a result. We all saw the humor in her name. I heard only about the mythical sister, Ura, but now I’ve learned that there was a third, supposedly named Hoosa. I’ve tried to figure out your neighbor’s moniker, but the only thing I can come up with is ‘alligator.’ Clearly, I’ve been on the bayous too long. Addressed being the clue as in Mr, Mrs, Miss or…Kids can be cruel. Oh. Kids can be cruel, and adults can be dense! What?? There really wasn’t a Ura Hogg? Gosh, I’d heard that as fact for so long that I never even bothered to check! Thanks for setting me straight. And these are perfectly lovely. I know. I was surprised when I learned the truth, too. It’s such a great story that I almost want it to be true — but it isn’t. Ah, well. Ima was a wonderful lady, and the story of the plantation between the Varners and the Hoggs is interesting (more about that later) so the truth makes up for the fiction in this case.